We look at three things when we design a walkway: functionality, safety and durability. At its core, a well-designed walkway provides users with an intuitive path from one point in a residential, industrial, or commercial property to another, while protecting the surrounding vegetation. Finally, a walkway should be sturdy and durable. Shoddy workmanship can lead to safety hazards on a pathway so it’s critical to work with the right professionals and the right materials. Interlocking stones are durable, stable and attractive. They come in a variety of colors, shapes and textures which allows homeowners to create their own unique design. For driveway or patios that already uses interlocking stone, it may be a great idea to extend its beauty to the front door or side of the house and into the backyard with a stone pathway. Additionally, with interlocking stone walkways, water drains quickly and safely. This is because of the gaps between each stone – which is filled in with sand to keep stones in place and weeds from growing – creates multiple paths for rain water or thawed snow to run off. With simple maintenance, interlocking stone landscape creates curb appeal that every neighbor will envy. Click here for the benefits of installing an interlock walkway. Click here to find out all the benefits of interlocking pavers. Concrete walkways are one of the most popu lar choices and for good reason. Concrete virtually requires zero maintenance and can withstand high volume traffic. It is also more affordable than interlock stone. With its ability to conform to any figure or path, it allows for flexibility on the walkway designs. Concrete can also be mixed with coloring agents which offers an extensive palette to choose from. The right walkway creates a pleasing aesthetic and seamless flow. We work with you to navigate the many ways that interlocking stone and concrete can complement your property. To learn more about whether you should use interlocking stone or concrete for your walkway, click here. You could also learn more about the average price of interlocking in Ontario, as well as how much concrete walkways cost. 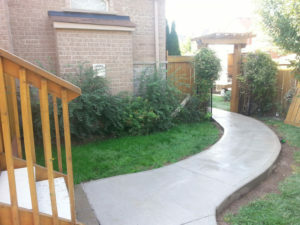 For a comprehensive look at the pros and cons of installing a concrete walkway, click here. See more of our walkway work. 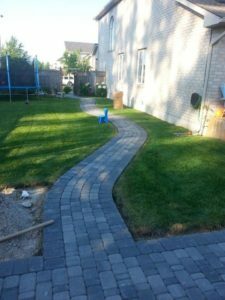 We are interlocking and concrete walkway contractors serving Mississauga, Milton, Brampton, Oakville and Burlington, Ontario since 2007.